This year's 12 top paid tech CEOs all make more than $15 million annually. Otellini was granted a 10% raise in 2012 partly to keep his compensation in the 50th percentile of a group of CEOs at similar companies. His base salary jumped from $1.1 million to $1.2 million and his incentive cash bonus jumped from about $4.8 million to $5.3 million. 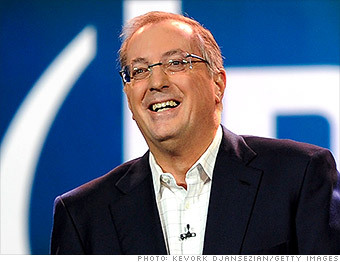 Otellini retired as the CEO of Intel (INTC) in May after working for the company for 38 years. Total compensation is calculated as the sum of base salary, discretionary and performance-based cash bonuses, the grant-date fair value of stock and option awards during the fiscal year, and other compensation like benefits and perks. Equilar, an executive compensation research firm, prepared the data by looking at CEOs of technology companies that filed proxies by June 3, 2013. See more on Paul Otellini from Equilar.